My daughter is not a great swimmer. I am concerned about swimming at camp. All campers must pass a swimming test administered by a certified lifeguard. The test involves each camper swimming across the pool and back. Campers that pass the test are given a ribbon to tie on their suits and are allowed into the deep end of the pool with access to the diving board. Campers that do not pass the swimming test will stay in the shallow end (3’) of the pool. We have one full time lifeguard and four adult staff members that monitor the pool whenever campers are in the pool area. My daughter has a peanut allergy. Can she still come to camp? Yes, your daughter is welcome at camp. We do not have a ‘peanut free’ camp but we can make your daughter’s unit a ‘peanut free’ unit. Our staff is familiar with children with life-threatening peanut allergies, and we do everything necessary to keep your camper safe. How safe is the archery range? We typically have two trained and certified adult archery specialists plus one or two teenage aides at this activity. Each camper spends the first morning of archery learning about archery safety. Only six campers are shooting at any one time. The other campers have a quiet activity to do while they wait their turn. Safety of our campers is our number one priority for any of our activities. Can I come to Arequipa to have lunch with my daughter? What if my daughter has a doctor appointment during camp? Visitors are not allowed at camp as it is very disruptive to the girls and to the program schedule. The gate is shut after the buses leave in the morning. This is to ensure no strangers come into camp. If your daughter has an appointment and you must pick her up early, send a note to camp and her unit leader will let the directors and nurse know. You must sign your daughter out with the nurse before leaving camp early. This is my daughter’s first time to camp. Can we visit camp before it starts to see what it is like? We currently do not have an ‘open house’ day for camp. We do, however, have a clean up day in late spring where any Girl Scout and her family is invited to come to Camp Arequipa and help us clean-up and prepare for camp. This includes picking up sticks and rocks leftover from the winter rains, cleaning the picnic tables and benches or helping with whatever building projects we have going on that year. There is something that everyone can help with. Keep your eye on our website for more information. Be assured that each and every camper has a wonderful experience at Camp Arequipa. Our volunteer staff is well trained and makes camp a positive experience for all our campers. This is one reason we have so many repeat campers and our camp sessions are so popular. My daughter can only come to camp for three days because of a prior commitment. Will this cause a problem? Our camp is a full five-day program. Each day’s program is built upon what the campers learned the day before. We turn away many campers each session. If your daughter cannot attend five full days at camp, please do not send her to camp this season. We would rather put in a camper that can make it all five days. My daughter is particular about what she eats. What if she doesn’t like the food being prepared for the cookout? Your camper will be able to help decide what her unit is cooking for the cookout day. The menu is usually varied so everyone will find something they like with the food served. If your camper doesn’t want to eat any of the food being served, she is welcome to bring a lunch that day. I am concerned about my young daughter riding the bus to camp. I always drive her places and would like to drive her to camp. We are unable to accommodate parents driving their campers to Camp Arequipa as there is a one-lane road into camp and we have 170 people coming into camp each day, plus we have the buses coming into camp. Every bus has an adult staff member on it from the first stop to the last. The buses also have teenage aides singing songs on the bus in both directions. There are bus safety rules that all campers must follow, i.e., no standing, no jumping, and no switching seats. Our buses are safe and the campers LOVE the bus rides. Can my daughter get off the bus at a different bus stop for a playdate after camp? Campers must get on and off the bus at their assigned bus stop only. We have bus checkers at each bus stop with a list of campers at that stop only. We have to maintain the integrity of each stop and cannot accommodate daily changes. If your daughter will be getting on at one stop and off at one other stop everyday, we can make this happen. But under no circumstances will your child be allowed to go to different bus stops throughout the week. I heard there is an overnight for girls in the fourth grade and up. What if my daughter wants to come home after lights out? We have a camp policy that any girl who signs up for the overnight will spend the night. If you think your daughter is not old enough to manage sleeping outdoors under the stars, you should wait another year for her to join the overnight. There are usually 40-60 girls spending the night, we cannot accommodate one or two girls that want to go home at 11:00 pm. It is very disruptive to have cars coming into camp after dark. So please explain this to your daughter when it comes time to make the decision about the overnight so there aren’t any misunderstandings. What about mosquitoes, ticks, bees and sunburns? As Arequipa is an outdoor day camp, we do have bugs and lots of sun! We suggest putting sunscreen on your daughter everyday before camp and sending sunscreen with her to camp to reapply after swimming. We also suggest spraying bug spray on exposed arms and legs. When we hike, the girls are asked to wear long pants tucked into their socks and to wear a shirt with long sleeves to minimize their exposure to ticks. We also recommend that you check your camper everyday after camp to look for ticks. We do have a full time nurse at camp. He/She can remove ticks and apply aloe vera to sunburns and bug bites. Plus, we do put up yellow jacket traps in the spring to minimize the amount of yellow jackets at camp. However, there are always a few stings, but our nurse has medicine for this also. Will my daughter earn any Girl Scout Try-Its or Badges at camp? The camp program is designed by Directors and often includes opportunities for girls to earn most or all of a Try-It or Badge. Information on completion of a program link or the entire Try-It and badge will be given to each girl at the end of camp. It is then up to the girls own troop leader to purchase the actual Try-It or badge. Camp Arequipa will only be giving out Camp Arequipa badges at camp and we will not be distributing any Girl Scout Try-Its or Badges. Can my daughter be placed with her friend in a unit? When you register, you can designate one name that your daughter wants to be placed with in camp. IF that child gets into camp, then we will make every effort to place the two girls together. If I volunteer to work at camp, can my daughter be in my unit? 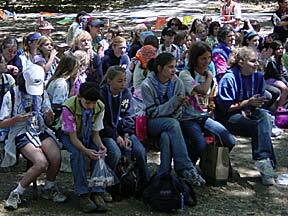 It is Girl Scout Camp policy to not place mothers/fathers and daughters in the same unit because of the potential for children to act out when parents are present. Additionally, it is important that the parent to be able to focus on the group of girls under their care, not just their own child. It’s a great way to share the camp experience in the car on the way home when each of you have had something different happen during the day. Why do I have to have training to work at camp? Before Girl Scouts USA instituted the policy requiring all day camp staffers to complete there were so many accidents that were happening in camps that GSUSA decided they needed to do something. They began training people on basic safety and emergency guidelines, site hazards and “what to do in case of” scenarios. Accidents in camps dropped by 80%! Need we say more?